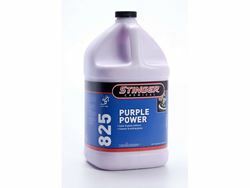 Stinger's Purple Power Buffing Glaze is a superior buffing polish designed to restore the luster and enhance the color depth in today's automotive finishes. It removes spider webbing and buffer swirls, leaving the paint with a durable hard finish. Available in gallon containers.